The definitive American classic car? Impossible to pin down, of course ... but the Ford Thunderbird must be in the running! Visually stunning, yet there is more to the Thunderbird than meets the eye. Like A strong and capable V8 engine, for starters - good for 120mph, in 5.1-litre format. It had previously powered the Ford Mercury. Given the styling of some of its rivals, early 'Birds were positively low-key! There is little that is excessive in the clean lines of the first Thunderbirds. There was almost something of the sports car about them! For that to have held true technically, too, though, you would have had to have been travelling in a straight line. 'Birds waded through bends - due to their super-soft suspension. 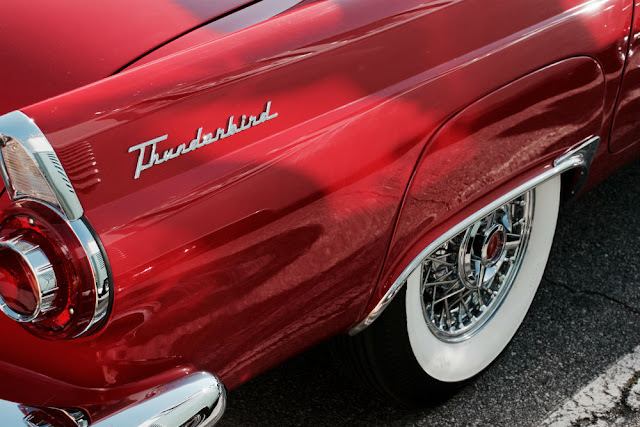 The Ford Thunderbird, then, was Fifties through and through. Like Elvis 'the pelvis' Presley, it started life lithe and agile - with an ebullience, and beauty all its own. As time went by, though, some of that grace faded. But, nothing can take away the glory days. When the fledgling Thunderbird - pristine and perfect - first flew the Ford coop.